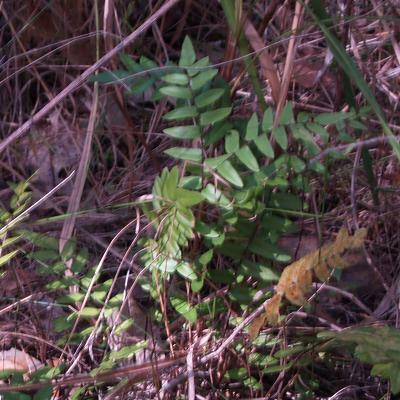 This fern is said to be found in rainforest or moist sclerophyll forest, often among rocks or on cliff faces or boulders, but at Tumbi Wetlands it is found amongst the grasses and sedges under a melaleuca. Its rhizome are fairly short and creeping with fronds 20� cm long. The frond has 25� crowded sessile or shortly stalked leaflets which are about 5� mm long and 2.5�mm wide, dark green above, pale beneath margins usually entire. Spore producing structures form a band along the edge of the leaves about 1 mm wide.